It is an ProCyte product. purified water, sodium laureth solfate, disodium cocoamphodiacetate, cocamidopropil betaine, ceteth-16, glicerine, laneth-16, oleth-16, stereath-16, PEG-75 lanolin, sodium chloride, Triamino copper nutritional complex (alanine/histidine/lysina polypeptide copper HCL), citric acid, diazolidinyl urea, hydrolyzed keratin, pantenol, metilparaben, propilparaben, peppermint oil, etc. This shampoo stimulates and restores health, structure and vitality of thin, falling and damaged hair. 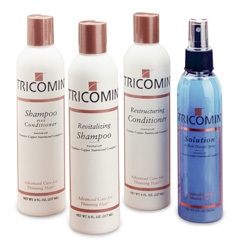 Dry your hair and then it is possible to apply Tricomin Solution Follicle Therapy Spray. Each bottle contains 237 ml (8 fl.oz). Here are some components contained in the product: purified water, sodium laureth sulfate, disodium cocoamphodiacetate, cocamidopropyl betaine, polyquaternium-11, sodium chloride, triamino copper nutritional complex (Alanine/Histidine/Lysine polypeptide copper HCL), glycerin, citric acid, diazolidinyl urea, hydrolyzed keratin, panthenol, methylparaben, fragrance, propylparaben, peppermint oil, FD&C blue #1.